As promised, here is the second figure in Dragon Models’ A Man Called Hero collection, Phantom Servant. Also known by such names as Ghost Servant, Ghost Server (sounds like a scary waiter), and Shadow (played by Dion Lam and voiced by Jordan Chan) in the 1999 Andrew Lau film, the character serves (get it?) as a trusted ally of the comic book’s main protagonist, Hero Hua Ying-Hung. Setting him apart from the pack is Phantom Servant’s curious appearance, as he is distinguished by a) his complete lack of arms and b) a horribly disfigured Phantom of the Opera-style mug. Sadly, I don’t own this figure, but you can check out pictures of this curious 12-inch figure just under the cut. Can you tell I’m a fan of A Man Called Hero? While I know there’s a lot of new and interesting toys on the market, this regular column will also be dedicated to the various Hong Kong cinema-related action figures I own, and — for good or for ill — a large portion of those toys include characters featured in A Man Called Hero and Storm Riders. From what I can gather, Dragon Models, Ltd. created this now decommissioned figure of Hero Hua Ying-Hung sometime around 1999, which you can find listed under the name of “A Man Called Hero,” “Chinese Hero,” and even “Oriental Hero.” I own the figure pictured on the right, which is based on Ma Wing-Shing’s popular comic book, but apparently there were at least three more versions of the figure created. One looks exactly like mine, except with a different hair color and costume (pictured below). The other two share a dramatically different head sculpt. 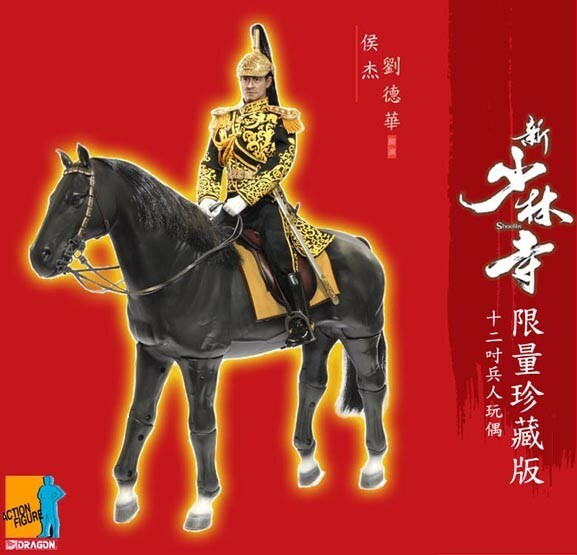 In conjunction with the 1999 movie A Man Called Hero, Dragon Models released two editions of the figure that bore the likeness of the film’s star, Ekin Cheng — an “old version” dressed in the same black wardrobe as the one I own and a “young” Ekin dressed in a brown-colored costume. From what I’ve seen, the box for both the comic and movie versions of Hero Hua appear practically identical. Too bad a scale version of the Statue of Liberty playset was unavailable for purchase. Many moons ago, I received two statues in the mail from my family in Singapore — Wind, one of the main characters from Ma Wing-Shing’s popular comic book, Storm Riders, and Hero Hua, the protagonist of Ma’s earlier manhua hit, Chinese Hero (aka: A Man Called Hero, The Blood Sword). Both characters have a Hong Kong movie connection as they were each famously portrayed by Ekin Cheng in the respective film adaptations. 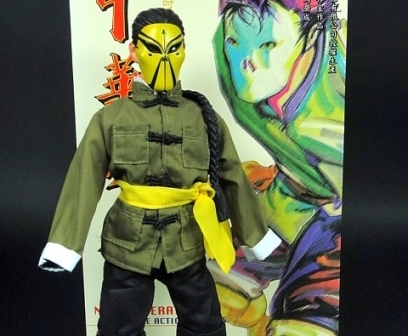 A few years ago, I bought this snazzy-looking Hua Ying-Hung action figure available to US customers via DrMaster Publications, Inc. I happened to have packed it up when I moved to Ann Arbor, so I figured I’d use it to help kick off a column I’m calling “LoveHKToys,” which will spotlight a different Hong Kong cinema-related toy each time it appears. 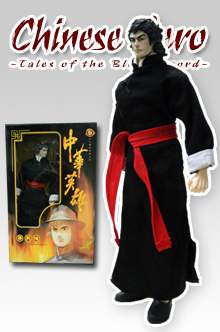 Dubbed “Chinese Hero: Tales of the Blood Sword,” this line of particularly figures based on the popular comic book also includes Invincible (played by Francis Ng in A Man Called Hero) and Ghost Servant (a masked Jordan Chan). I don’t know the particulars, but they seem to be either re-issue or simply old stock of a previously existing line. I know because I bought Ghost Servant in Singapore several years earlier, and he came in an identical box as the one pictured here. When the figure arrived, I got quite a shock when I discovered it was SPLIT IN TWO PIECES! Luckily, it wasn’t broken, but I did have quite a time trying to force the two parts back together. Thanks to a handy pair of pliers and some good old fashioned elbow grease, I was able to make the Man Called Hero whole once more, and all without breaking the figure in the process. That shock was almost as bad as when I discovered that Ghost Servant didn’t have any arms. For those of you who don’t know, the character actually is armless in the comic and the movie, a small fact that somehow eluded my attention prior to purchase. There’s not much “action” to be had from a figure with missing appendages, but hey, that’s the character. Hero (aka Hua Ying-Hung/aka Ekin Cheng) isn’t a bad figure. Meant to resemble the comic character, the face is well-sculpted, if a little roughly painted. There’s not much “action” to him either, although he is poseable. Hero comes with the Blood Sword, a scabbard, and a hat he can wear at a rakish angle whenever he feels like crooning a Sinatra tune. I never got around to buying Invincible to complete the set, but if I do, you’ll be the first to know. In the coming year, stay tuned to this space for more Hong Kong cinema-related action figures. If you want a closer look at the figure, click on the thumbnails below to enlarge the pictures. Obviously, I’m a terrible toy photographer, but I promise I’ll improve as this irregularly updated column develops. I have to level with you: the title of this post is purposely misleading, as I have not seen anywhere near enough Hong Kong films this year to be even remotely qualified to assemble a proper “Best of” list for 2010. I’d love to do it; it’s just not possible. To tell the truth, you can count the number of 2010-released Hong Kong films I’ve seen on one hand — Crossing Hennessey, Fire of Conscience, Ip Man 2, Little Big Soldier, and True Legend. So, that makes only makes five movies I’ve seen total; well, I suppose if you were getting creative, you could say I’ve seen six — that is, if you count Jet Li’s performance in Sylvester Stallone’s incredibly disappointing action extravaganza, The Expendables. If a) Jet’s totally out-of-sync performance with the rest of the cast didn’t make me think he was just there to cash a paycheck and b) his one-on-one fight with Dolph Lundgren hadn’t been so terribly, terribly choreographed, I might be persuaded to think that it somehow “counts” as a Hong Kong film. Either way, it doesn’t.